Home » Posts Tagged "special session"
Parents, students, citizens, families and educators are planning to gather tomorrow at 10:00 a.m. on the south steps of the ‪#‎ksleg‬ statehouse (adjacent to 10th Ave) to rally to “SAVE OUR SCHOOLS.” This is a grassroots effort planned by parent and citizen groups. In 2014, KNEA began its “Join Us.” campaign to encourage Kansas citizens to join the efforts of our members to promote public schools in Kansas. We’re now seeing the results of those efforts. KNEA supports the effort of the groups who have organized on their own to plan and lead tomorrow’s rally. With less than a day to go, KNEA President Mark Farr has encouraged KNEA members to remain engaged and vigilant, and to keep contacting their representatives with a clear message. The Legislature must respect the ruling of the Court regarding funding equity (equalized funding for all KS schools) with a clean bill. Most importantly, KNEA and Kansas citizens expect schools to be open this fall and fully resourced with staffing and materials necessary to provide the best education possible for students. The Court has done its job. Multiple statewide surveys indicate that citizens support the Court and look to the Legislature to finally do its job. After the longest session in state history last year, Kansans have very little appetite for any shenanigans that could extend the problem. 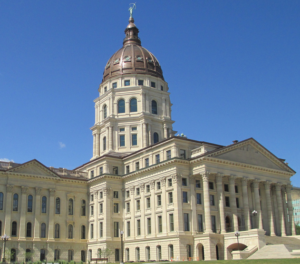 With the special session of the Kansas Legislature just about a week away, now is the time for you to engage your representatives if you have not done so already. Once they are under the dome, legislators tend to be focused on the politics within the building. Most- not all- will take your calls, but in large part they are swimming in the ebb and flow of policy debate. Click Here to find out who your reps are and contact info. You have an expectation that the Legislature will finally do their duty according to the state Constitution and fund public schools equitably and adequately. You expect them to steer clear of the political wrangling based upon the desire of some of the Governor’s closest allies to punish the Courts for doing their duty. The Supreme Court does not seek out cases. They take cases brought before the court by complaint of citizens and they rule on the constitutionality of the laws at the basis of the complaint. The Court’s rulings in this case reflect the nature of the three branches of government system our state and nation were built upon to provide checks and balances against abuse of power. The Legislature led by the Governor’s closest allies have created the conditions of inequity and inadequacy in school funding and it is the Legislature that is responsible for correcting these conditions so that schools will open in the fall. 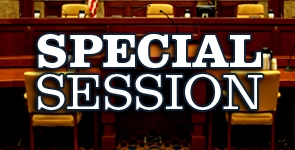 You expect your representatives to have a single focus during this special session. They should correct the conditions of inequity that exist without engaging in additional policy attacks in order to conclude the session quickly and ensure that schools open this fall. Tell your story. How does the actions of your representatives translate to you in your community. Give examples. Over a period of about one week, we conducted a non-scientific opinion poll. The poll was modeled after a recent poll published in the Kansas City Star. 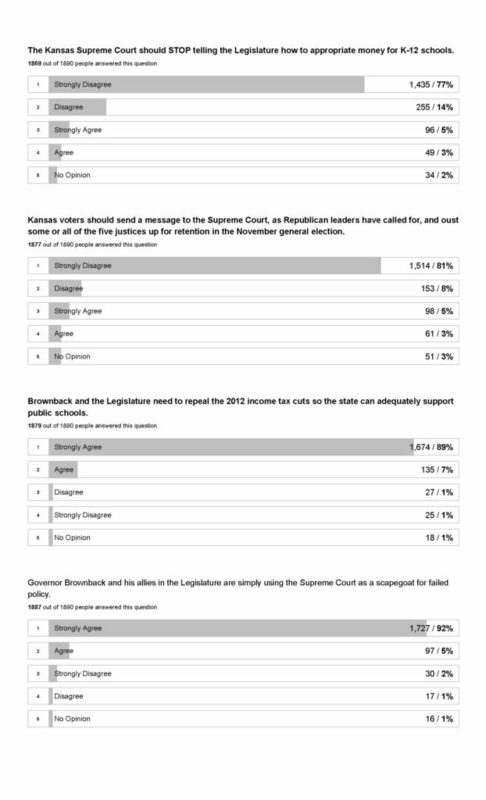 Our goal was to publish the poll publicly via social media and engage respondents statewide. While we make no claims about the scientific nature of the poll, we did take some very specific measures to ensure validity. The results reflect only responses from unique I.P. (internet protocol) addresses. Basically, this means that responses which were likely to have originated from the same device were excluded from the results. We published the poll within our organization’s social media properties, but we also published the poll through promoted posts statewide. 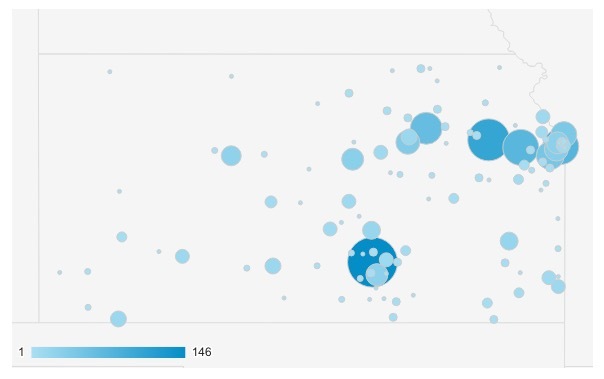 After filtering the results as mentioned above, we ended up with nearly 2,400 responses and over 1,800 “valid” responses. The results are displayed below along with a map displaying the general locations of respondents who completed the survey. Click the images to view full size. Governor Brownback this afternoon announced that a special session of the 2016 Kansas Legislature will begin on Thursday, June 23 at 8:00 am. The deadline set by the Supreme Court for the Legislature to act is June 30. 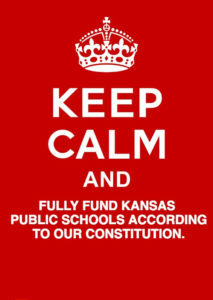 We would imagine that the Legislature is hoping to get in to Topeka, get the job done, and get out. This is an election year with an early August primary. The longer the special session lingers on, the fewer days candidates will have to knock doors and campaign for votes. At issue also is the prohibition on campaign contributions while the Legislature is in session. Everyone with an interest in the opening of school come August hopes that this will be a very short special session and that the Court will be able to issue an opinion on the results as quickly as possible. Schools will hopefully be able to fund July activities that prepare our buildings for the opening days in August. 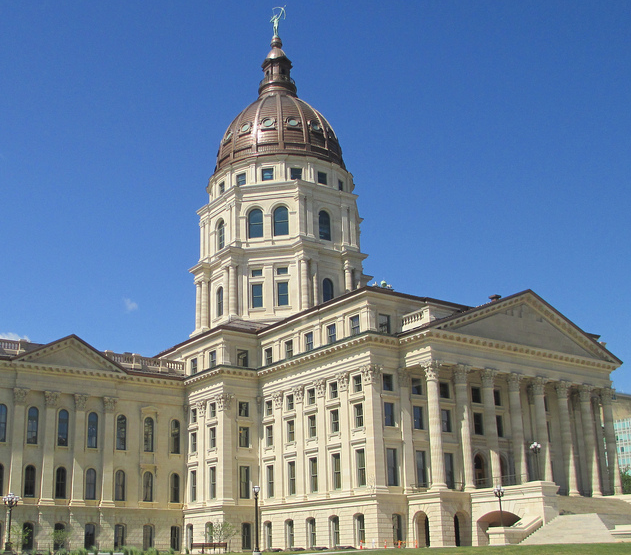 We are pleased that the special session has been announced and we urge all lawmakers to return to Topeka ready to resolve the issue and open schools for our students in August. We will be keeping you up to date on any news or actions taken during the time between now and June 23. As always, we urge you to stay vigilant, stay engaged, and keep talking to your legislators while they are back home.